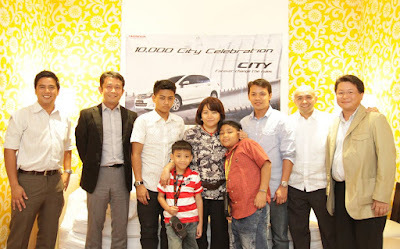 Honda Cars Philippines, Inc. marks another milestone as it reaches 10,000 City sales since the introduction of the 3rd generation City in January 2009. Sale of 10,000 City units in just 14 months signals how the City has successfully changed the rules in the subcompact class. “The Honda City’s over-all value for money package has gained worldwide market acceptance. Loaded with functionality features yet low in maintenance and fuel consumption costs, the City’s popularity has gone beyond Asia and has reached Africa, Middle East and European regions. Here in the Philippines, we are truly honored and grateful for receiving warm support from the market. This enabled us from realizing one feat after another. Apart from 10,000 City sales for the 3rd generation model, the City also posted its highest monthly sales of 811 units in February. City sales also continue to increase with 18% growth as compared to January sales and 9% growth versus February of last year. Since 1996, local City sales have reached almost 54,000 units. We thank all City owners for making all these achievements possible. Their non-stop support drives us to continue improving our products and services that will suit their changing needs.” said Mr. Hiroshi Shimizu, president and general manager of Honda Cars Philippines, Inc.
As a sign of its heartfelt appreciation, Honda gives honor to its 10,000th City owner, Ms. Maria Fe Ramos. Ms. Ramos, who bought her unit from Honda Cars Kalookan Inc., is actually a first-time Honda owner. “I’m very proud and surprised to know that I was the 10,000th City owner. Upon reading good reviews from the internet about the City’s amazing fuel consumption and after seeing how the bold beige color makes the City look more elegant, I immediately made up a decision. I knew right away that the City is the ideal car for my needs.” said Ms. Ramos. As a simple token of appreciation, Ms. Ramos receives an exclusive lifestyle package and Honda premium items. More than the usual subcompact sedan, the City combines modernism with practicality through its sophisticated styling and class-leading features. It is equipped with an i-VTEC engine that delivers maximum power output of 120 ps for 1.5 liter variant and 100 ps for 1.3 liter variant. Always at the forefront of promoting green motoring, the City, just like any other Honda models, complies with EURO 4 levels even if Philippine government only mandates EURO 2 levels to ensure cleaner emissions. Anti-lock Brake System (ABS) and Electronic Brake Force Distribution with Brake Assist (EBD with BA) are also standard features for your better peace of mind in times of emergency situations. To be part of this amazing feat, visit any of Honda’s 26 dealerships nationwide or check out www. hondaphil.com for more details. Just always remember to try before you buy. Be smart! Test drive!